April 2014 – In honor of National Grilled Cheese Month, with the help of the Midtown Neighborhood Association and Rowerdink, Inc. we hosted a grilled cheese competition at the park across from the Cheese Lady shop. 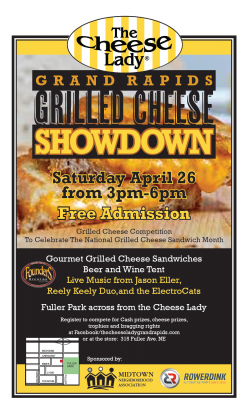 Grilled Cheeses all day long, samples, beer, wine, music and fun for the whole family. Cash and cheese prizes for the winner in both people’s choice and Judges choice were awarded…Congratulations to our winners and we all win because you can see the winning recipes below! Stay tuned for next year’s contest! Sourdough bread, French Raclette and Amablu, candied bacon, dried dates, fresh sage, and they used the grease from the bacon to grill it…YUM!